Wobbles first caught Katherine’s attention because she was making a funny, honking sound. At four months old, Wobbles found herself abandoned and alone at Chicago’s Animal Care and Control (CACC). Her cage card labeled her as a suspected Cerebellar Hypoplasia cat. Katherine knew a CH kitty would not survive long at CACC so she brought her home to foster, but within three days she knew Wobbles would stay with her forever. Cerebellar Hypoplasia is a disorder in which the cerebellum doesn’t develop completely before birth. The cerebellum region of the brain controls balance and coordination and thus, cats with CH have mild to severe motor control issues as well as tremors. CH kitties are generally wobbly and unsteady and sometimes topple over when walking – hence the nickname “Wobbly Cat Syndrome”. CH kitties do not experience any pain or long term health concerns as a result of their condition. Like other cats, they can live long, happy lives and develop strong bonds with their human and furry families. You can learn more about Cerebellar Hypoplasia here. Wobbles has mild CH. She pulls herself up on the bed and couch using her nails. Sometimes when she tries to jump, she just bounces in place. She occasionally runs into things and falls over, but quickly picks herself up and goes about her business. Wobbles loves people and other cats and is pretty much the resident therapy cat for anyone in need. Most importantly, she never lets anything hold her back and doesn’t realize or care that she is different. Wobbles shares her home with another wobbly cat named Fawkes. Fawkes is not a CH kitty. Tragically, his issues are the result of human cruelty. When he was a year old, he was turned into DuPage County Animal Control after being found buried under cinder blocks. He suffered a broken femur and his hip joints were shattered. Like Wobbles, Fawkes is a little unsteady on his feet and his tail and hips remain slightly crooked and off-kilter. In addition to his coordination issues, Fawkes has a history of pancreatitis. He also started off as a foster cat, but after seeing him through several bouts of pancreatitis, Katherine made things permanent and adopted him. Although Fawkes has suffered unimaginable pain, he remains gentle and loving. Because pancreatitis can appear without warning, Katherine says she has learned to be sensitive and tuned in to his needs on a much deeper level and as a result, their bond is incredibly strong. Katherine says both Wobbles and Fawkes have taught her to live in the moment. Neither cat lets their issues hold them back and both seem comfortable with their strengths and limitations. Their confidence, courage, independence, and, in Fawkes’ case, forgiveness, is truly inspiring. Katherine wishes others would open their hearts and homes to special needs cats like Wobbles and Fawkes. You can learn more about Fawkes and Wobbles by following them on Instagram. Please also check out Grassroots Animal Rescue, the wonderful organization for which Katherine fosters. For more information on Cerebellar Hypoplasia, please visit our friends at The Kitty Cat Chronicles. Please consider fostering or adopting a special needs animal because different is beautiful and second chances are amazing. If you enjoyed this post, please check out my posts on adopting a deaf dog and adopting a survivor of abuse. Wobbles and Fawkes are part of The Specials, an award-winning blog series focusing on special needs pet adoption. Senior pets, those with chronic medical issues, behavioral or temperament concerns as well as overlooked or misunderstood breeds like Pits and black cats. If not for the courage and compassion of their adopters, many of these animals might have been euthanized in shelters or died alone and hungry on the streets. You can read more special needs adoption posts here. Who could resist such a cutie ! She has such a beautiful face and on top a good character so such a disease is bearable ! My old Pookie has arthritis and doesn't jump anymore neither she helps herself also with her claws ! We are so happy for Wobbles and Fawkes! Bless you Miss Katherine! CH pets can make such good pets! Paws way up to Katherine to seeing past the wobbles to the wonderful companion kitty. She sounds like a really special human. I'm so glad they found a human with a golden heart…. hugs to Katherine! I had never heard of CH. Katherine is wonderful. My hat off to her this morning for helping two beautiful cats! What a beautiful story! Katherine is an amazing person to adopt these two amazing kitties. Both are just so precious. Wobbles and Fawkes are both adorable! Thank you for sharing their story and for helping to spread the word about CH. Thanks also for linking to us! 🙂 Love this series you are doing!!! Wobbles and Fawkes are both beautiful, and they are so lucky to have Katherine. Brave kitties like Wobbles and Fawkes inspire me so much. And, stories like this and people like Katherine give me hope in humanity. Thank you for yet another wonderful story about the amazing special animals in this world. They are BOTH Beautiful and we are so happy that they have found the PURRRRRfect home to be in. What a wonderful post and what a great person you are to take in these two cats. We sure do thank you many times over. That's a sad, happy story. We're so glad both cats were adopted. Thank you for telling us about these two wobbly but wonderful cats. Seems like we have much to learn from them and their lovely carer Katherine.Cheers.Gail and Bertie. Paws up to Miss Katherine for giving Wobbles and Fawkes a wonderful home. 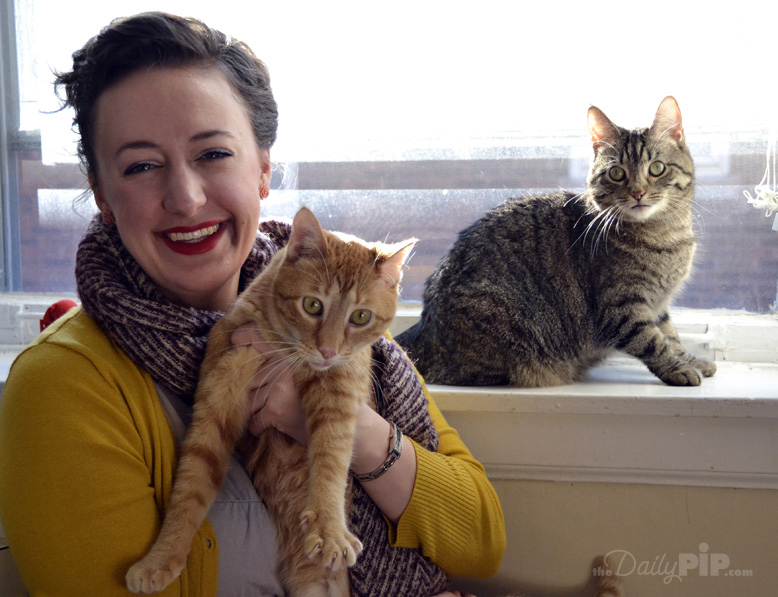 Thank you, Miss Katherine, for adopting these two special kitties and giving the a wonderful home. I've never heard of CH before. Thanks to Katherine for taking such excellent care of Wobbles and Fawkes and giving them a loving home. I really enjoy these "Specials" posts. My heart breaks for Fawkes. Humans can be so very cruel. Thank God for wonderful people that open their hearts and homes to these wonderful pets. Fawkes' story breaks my heart. I am glad these 2 have a loving forever home. Again another amazing story of awesome Peeps and amazing Kitties finding each other. Thank you for the inspiration! Wobbly cats are very special and we're a big fan of Sophie from Kitty Cat Chronicles. I'm enjoying the specials series, it's a great idea! I love that you're educating about these wonderful kitties. They're so determined to just live their life, it's inspiring. They are very lucky kitties to have such a loving human. Who among us doesn't wobble a little? Thanks for sharing this very important message. I will tweet it out, too. We love your series "The Specials"!! Bringing awareness to special needs pets is SO important!! We're learning more and more about wobbly cats. Mom Paula has met Sophie who lives with Emily and is a wobbly kitty. Sophie is adorable and gets around well. Great post. It will help people realize how 'special' these companions are.